ESTELITE® SIGMA - New Composite (tooth colored) filling material. Utilizes revolutionary initiator system "Radical Amplified Photopolymerization Technology" (RAP). OraVerse is the first and only product to rapidly reverse the lingering numbness after a dental procedure. The average duration of numbness after a dental procedure is 3-5 hours. OraVerse is administered by Dr. Kogan immediately following a procedure, allowing for a return to normal sensation and function in about 30 minutes. In about 30 minutes you can get back to feeling normal and get on with your day: important presentation at work, meeting with the client, romantic dinner, etc. Just ask for OraVerse when you come in for your next treatment. You brush your teeth, but what do you use to clean your toothbrush? Studies show that upwards of 10,000,000 microorganisms can thrive on toothbrush bristles at any given time. Most people keep their toothbrushes in the bathroom. Flushing propels germs from the toilet into the air, where they can land on toothbrushes. Moreover, toothbrushes are usually stored together, so contact between family membersâ€™ toothbrushes can spread germs from one brush to another. Also, our toothbrushes become the source of re-contamination when we are sick. VIOlight is an easy-to-use toothbrush sanitizer that uses a powerful, yet safe, UV-C light to destroy the toothbrush germs that you donâ€™t see. The germicidal UV light destroys the DNA in bacteria by operating at a wavelength of 253.7 nanometers. This is the same technology that is used in hospitals, food preparation, medical offices, and water sanitization. 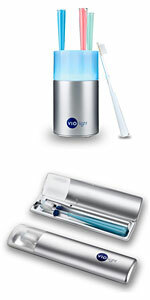 We, at The Dental Spa, use VIOlight sanitizers for our personal toothbrushes and recommend them to all our patients. VIOlight sanitizers work for manual toothbrushes as well as electrical toothbrush heads. For the convenience of our guests we carry VIOligtht toothbrush sanitizers in stock. They come in a individual/travel size and countertop size.